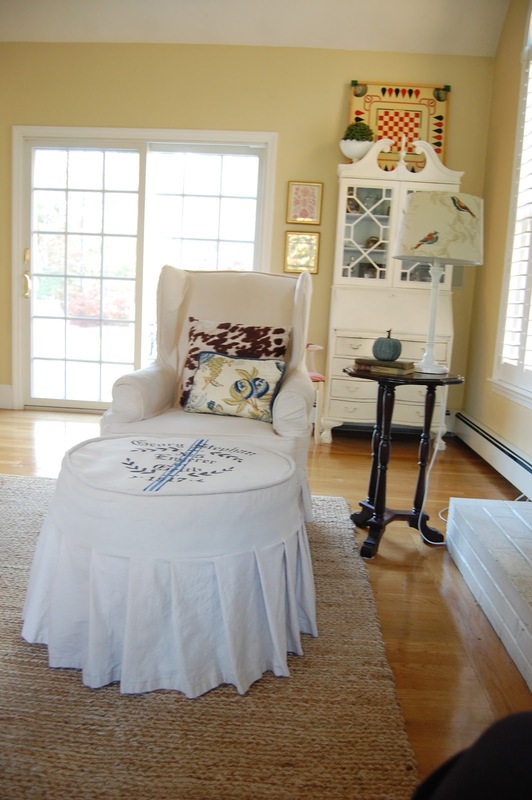 Finding Grace Interiors: A new slipcover for my ottoman. 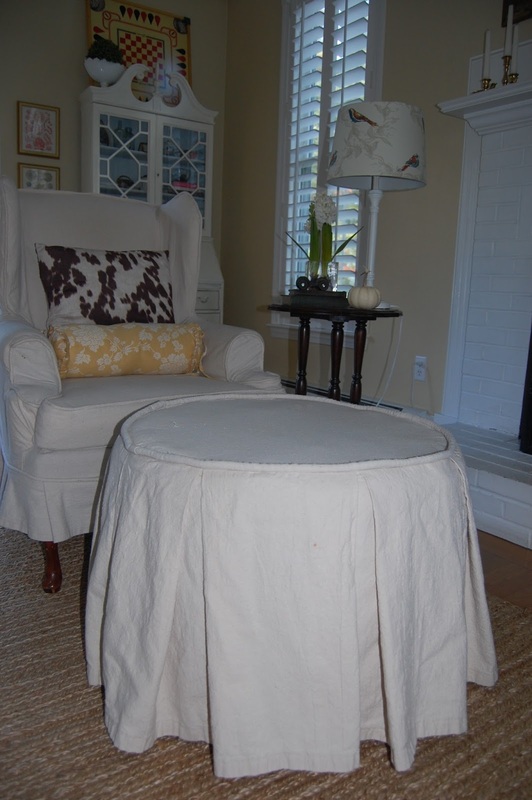 A new slipcover for my ottoman. A while back, when I redecorate my family room, I needed an ottoman to go in front of one of my chairs. This is where hubby sits to watch TV, and where I sit to read, I wanted us to be comfy and to be able to put our feet up and relax. So I found this round ottoman at my local thrift store. I loved the round shape and the size, but the fabric color and pattern wasn't going to work out. It was olive green with cream flowers. So I quickly made this cover out of a drop cloth. It was like this for a long time, but it never looked right to me. It was something off about it. Don't you think? So on a rainy Sunday I decided to dissect the ottoman cover and start over. I took it all apart and this time I made a straight strip to go across all around it, shortening the skirt. I think it already looks better. The skirt before was too long. But it was the first one I ever made, so I guess you live you learn, right? I also change the direction of the pleats. I like it this way much better! Thank goodness the piping worked as the top was the same size. I don't like to make piping. So I was happy to recycle that part and use the same!! Do you see where I am going here? Yes, I do have a bit of an obsession at the moment with European grain sacks. So out came the tape and the paint!! Thank you so much for visiting! I hope you enjoyed my ottoman slipcover makeover! Looks fantastic! Love the addition of the "grain sack" motif. This is totally impressive to me! The whole room is gorgeous. AWWW, thanks a lot Stacey! A beautiful room for sure. Love the ottoman. I would be lost without one. The motif is extra special. It turned out fabulous Cristina! I wish I could sew as well as you. Oh that is better! I love the stencil....just perfect! Great job...you could sell those! Thank so much Nancy! You are so sweet! You did a fabulous job. Isn't drop cloth the greatest? Wow...the slipcover turned out AMAZING!!!! I love the grain sack stencil you added....just the perfect touch. Thanks so much Des!! Your comment means the world to me! It's gorgeous! The stencil added the perfect touch! Just lovely! Thanks so much Lisa! You are so sweet! Oh goodness! You caught my eye with this transformation and naturally I had to pin it too! Thank you so much for sharing this with us today at Thoughts Of Home On Thursday! That looks SO good! I'm so impressed by your sewing skills. I wish I knew how to sew like that. I love the ruffles and the stencil on top. That makes such a charming statement in your room. your makeover of your makeover turned out so well. the top looks like you used a real grain sack to me. must try this. thanks for the inspiring post. What a wonderful transformation and I adore the embellishment of the grainsack design. Your post was such a joy to read and I hope you will continue to join us at Thoughts of Home on Thursday. May you have a happy week! Thank you so much Laura! Yes, I will be at Thoughts of home on Thursday, Thanks for having me! I love her now too! I like the added blue and the details! Great job! You are very creative. Where did you get the stencil pattern? Hi!! Thanks for stoping by!! My name is Cristina, I was born and raise in Spain. English is my second language. There for my accent when I write. Please forgive me :) I would like to share with you my love for decorating, painting furniture, antiquing, crafting, shopping and anything exciting that crosses my path!! Please get comfy and stay a while!! A Surprise came in the mail! Spring in the Powder Room! Spring in the Dining Room!